← Editorial | Seek the Geek! 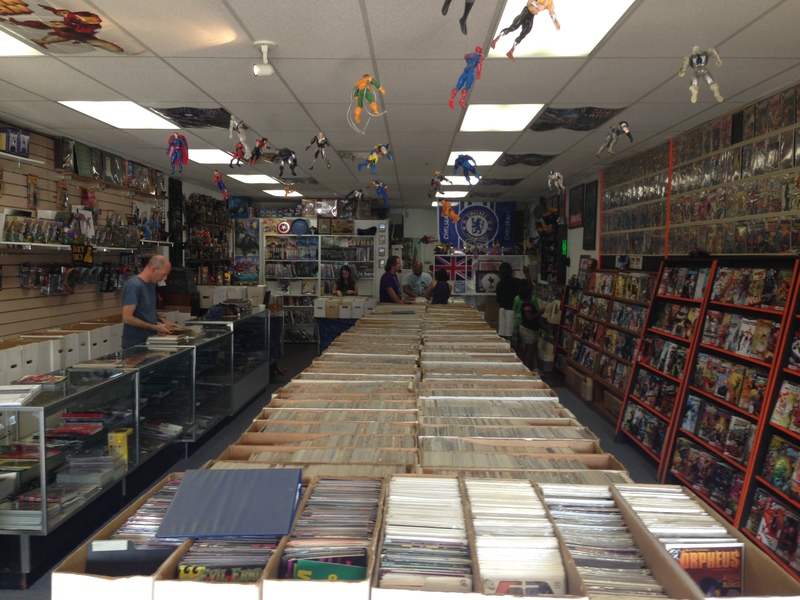 Throughout my travels, I have had the chance to visit comic shops in many different places. I have come to realize that while every store has its good and bad qualities, they tend to fall into five categories: the back issue store, the graphic novel store, the hangout store, the mega store, and the scary store. 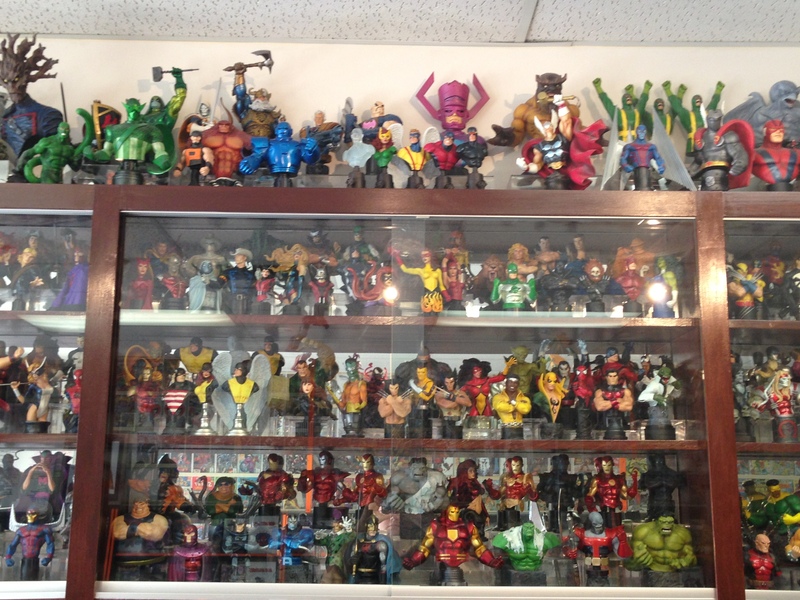 The back issue store—or traditional store—is the stereotypical comic book store. 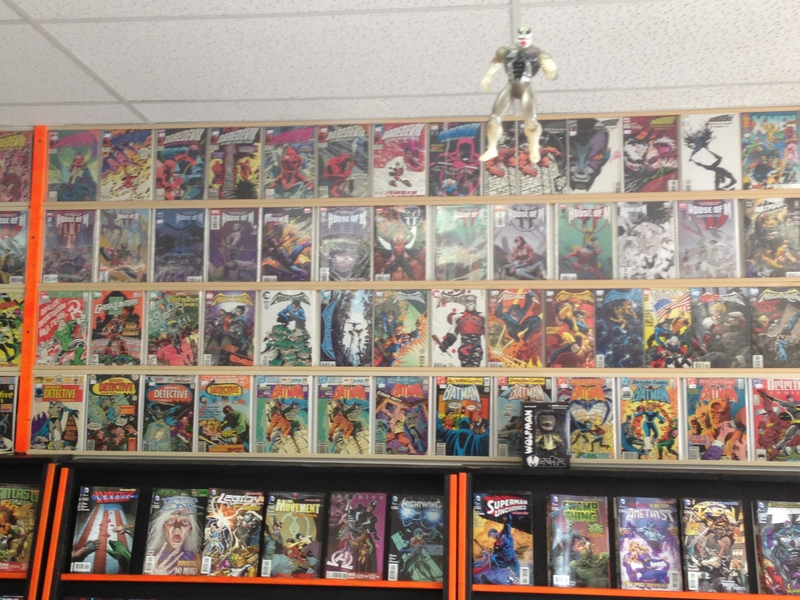 Typically these stores are filled with long and short boxes of older comics. More recent ones tend to be easily accessible on shelves or racks of some kind. Usually these stores have a selection of “wall books” as well. Wall books are books of higher value that are displayed prominently on a wall somewhere, often (though not always) behind the counter. These are not behind the counter, as you can see. I usually can’t afford wall books, but they are always fun to look at. It’s great to see the different books from comic history. Frequently after looking at the wall, I’ve gone home and Googled certain books to find out what makes them special enough to go on the wall. Because there are so many back issues, the issues aren’t usually priced in advance. Books in these stores are either in price marked boxes (dollar bins, etc) or priced out at the register. Free space taken up with cool displays. The graphic novel store is one of the most useful ones for people who are new to comics or are on a budget. 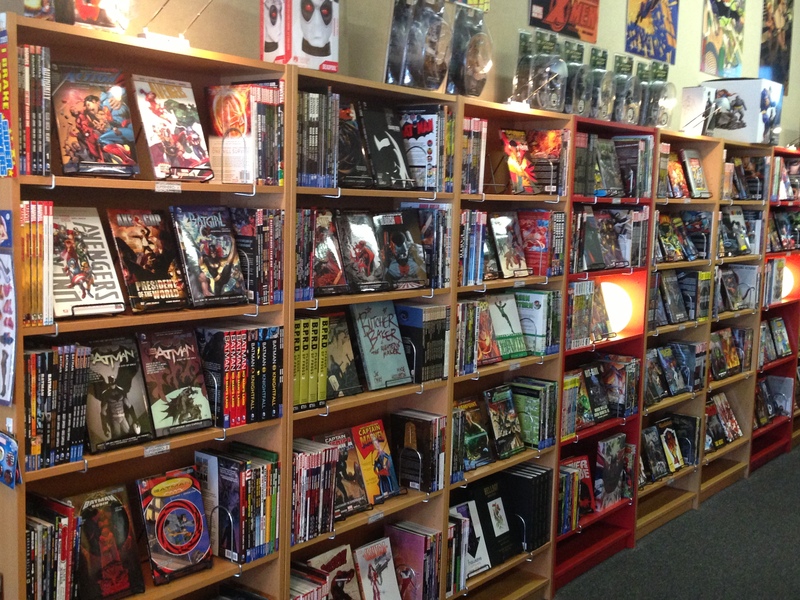 These stores typically have book cases filled with graphic novels from various publishers. Methods of organization vary from store to store, but generally the stores are pretty good about keeping things in some semblance of order. 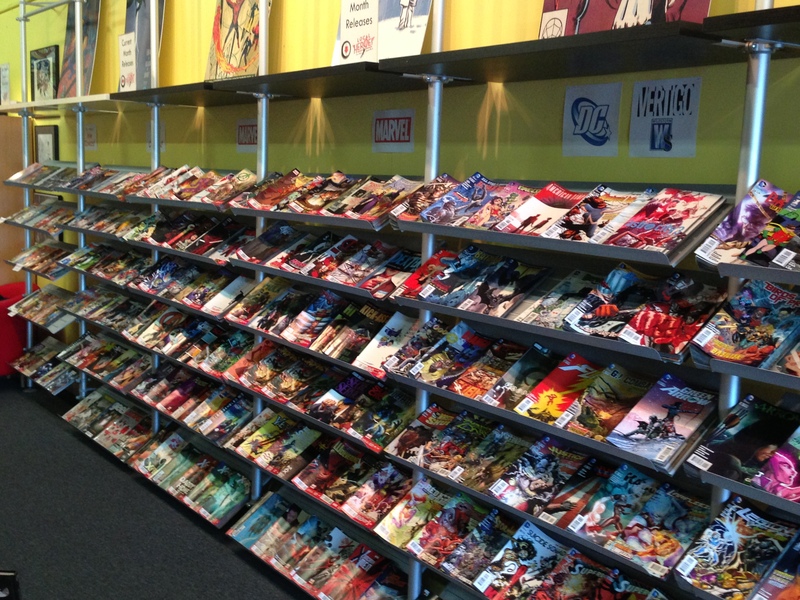 Stores will usually have the most recent week’s comics and a few months of back issues, but not much more than that. Normally graphic novel stores have significant selection as well, including non-superhero stuff, which is great for people who are interested in the medium but not in capes. On more than one occasion we at Therefore I Geek have talked about how important it is for geeks to socialize with one another. The hangout store is an ideal place to do this socializing. Here it is guaranteed that most, if not all, of the people share your geek interests. 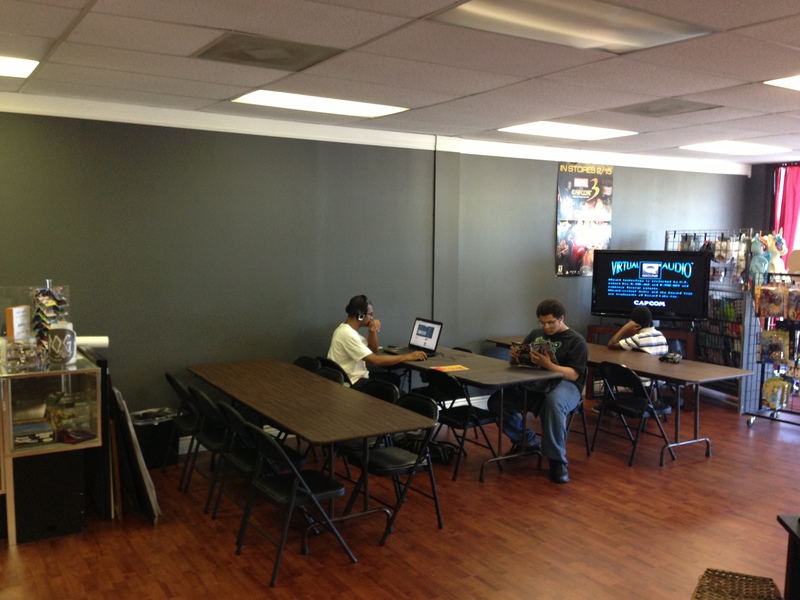 Usually these stores have several tables and chairs that people use for gaming and just general socializing. Tables for gaming and general hanging out. A select few of these stores consider themselves reading stores in which you can sit down and read the comics before you buy them. This kind of stores allows you to check out books, moments after you find out they exist and then turn right back around and discuss them. Almost nightly there will be some kind of event going on, whether it be Magic: the Gathering, board games, or miniature gaming. 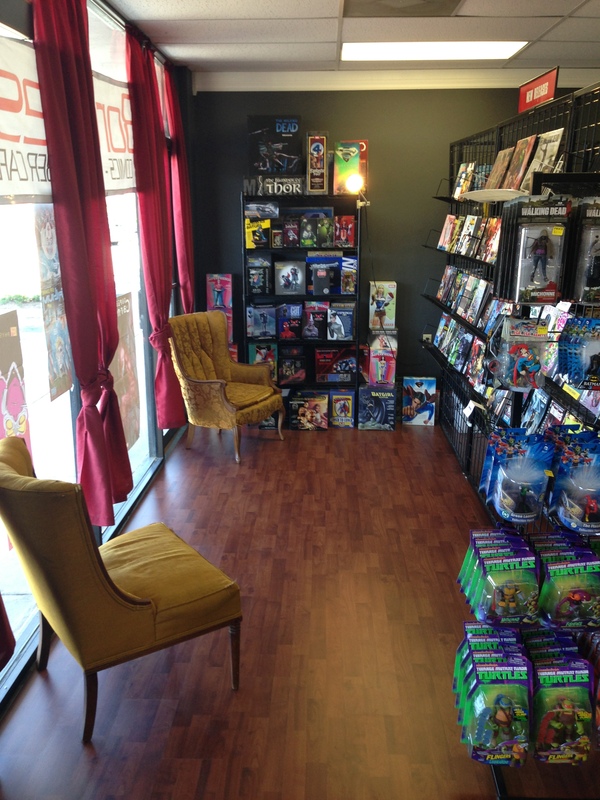 For the geek moving to a new area, this is a great place to start making geeky friends. Those are some comfy chairs. I can personally testify to this. I was very lucky (spoiled really) to start reading comics while going to college in New York City. Not only does NYC have a plethora of good comic book stores, they also have Midtown Comics. Stores like Midtown are comic mega stores, which encompass most aspects of the three types of stores I’ve already talked about. 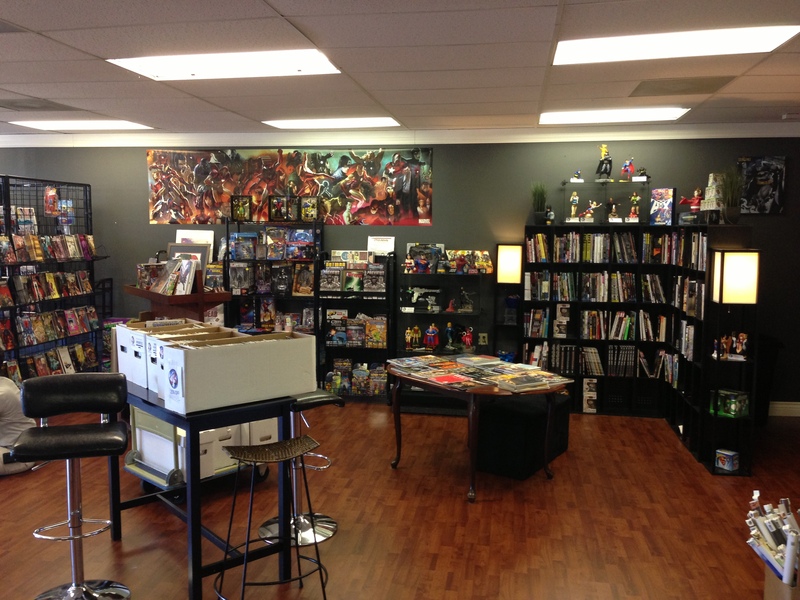 They have huge selections of back issues, graphic novels, and other comic book paraphernalia. Often times these stores have more than one location. This is useful because if one store doesn’t have what you’re looking for, it’s possible that one of the other locations does. The size of the store also means that they often have better infrastructure and organization so finding things is easier and prices are usually clearly marked. The downside of stores this size is that there is the potential for customers to get lost in a crowd and not get to develop a more personal relationship with the owner, such as at smaller stores. Lastly there is the scary store. These are the comic book stores from which stereotypes are derived. Often times they have a dungeon-like feel to them, and some smell of mold or cat urine (Why do so many stores have cats?). Poorly lit and generally unpleasant, these stores either have very little regard for the goods that they sell and treat them badly, or value them far too highly and grossly overcharge people who don’t know any better (I’ve fallen victim to this more than once). Not all scary stores are that way because of physical conditions either. Some fall into this category due to the people who run the store. They are rude, not helpful, or downright creepy. The rudeness is almost worse because what could otherwise be a great store is ruined by one or two bad people. The only true redeeming quality these stores have is that people don’t often go in them and so they frequently have stuff that is hard to find or out of print. I know of one particular store that I can go into and find almost anything I’m looking for, if I’m willing to suffer through the experience. 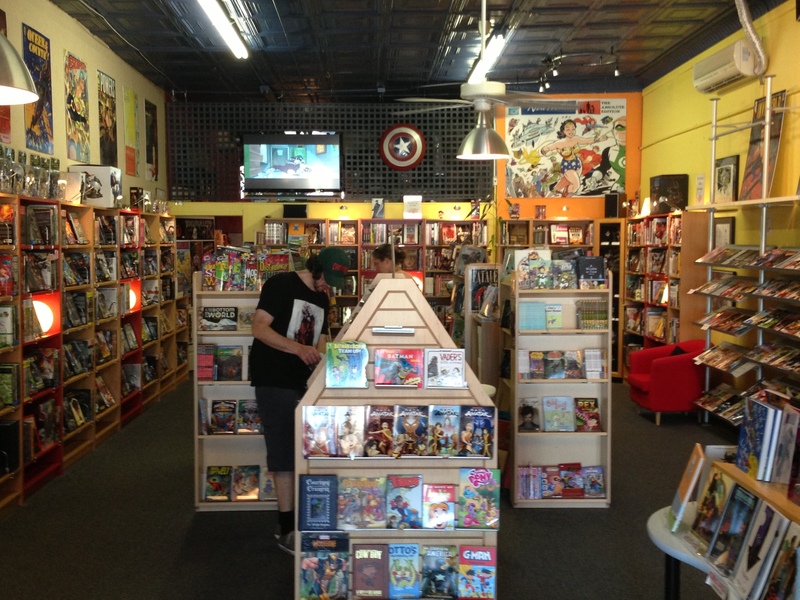 The reality is that not all comic book stores are made equal, and that’s okay. Not all stores fit into these exact molds. Sometimes stores combine one or more of these traits. The key is finding the store or stores that are best for you. Rarely will you find everything you want in one store, but don’t lose hope. New stores are opening all the time, each one a bit different, with their own unique qualities. If you don’t see what you’re looking for, many stores also are willing to special order stuff for you if they don’t have it in stock, so long as it is in print, or at least available from Diamond. Get out there and take a look. You never know what treasures might be hidden in some store you didn’t know existed.